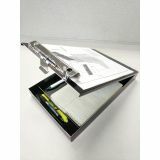 Saunders Redi-Rite Aluminum Storage Clipboard - Storage clipboard features a sturdy, lightweight design for easy handling throughout your day. Its durable construction withstands the rigors of daily abuse to stay strong whether you're working indoors or out. High-capacity clip holds tightly onto 1" of papers. 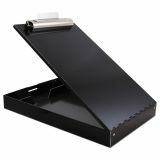 Large internal compartment offers plenty of space to hold letter-size paperwork, business cards, writing utensils, and more. Self-locking latch fastens the cover tightly to keep everything in place while allowing easy access as needed. 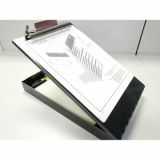 Storage clipboard is perfect for public safety workers, law enforcement agents, EMTs, coast guard, coaches, inspectors, contractors, truck drivers and more. 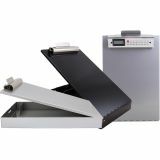 Unit Dimensions: 2.75" x 9" x 14.25"